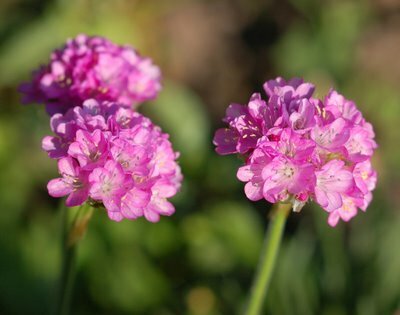 Sea pink, or sea thrift (Armeria maritima) is the first perennial I planted in my garden when I stared it two years ago. It originates from northern Europe and around the Mediterranean, where it can withstand the salty mists along coastlines and sea cliffs. Growing to about 8 - 12 inches tall, it makes a great edging plant. It requires little maintenance and has a fairly long bloom period -- from now until mid-summer. My mom gave me the sea pink plant as an Easter gift two years ago. When it blooms, it reminds me of her.